Leo Tolstoy’s Doukhobors: The culture of this remote pacifist sect in Georgia is on the verge of extinction. Leo Tolstoy so admired the Doukhobors, a remote pacifist sect in the highlands of Georgia, he tried to shield them from the modern world. Now only 500 of them remain. 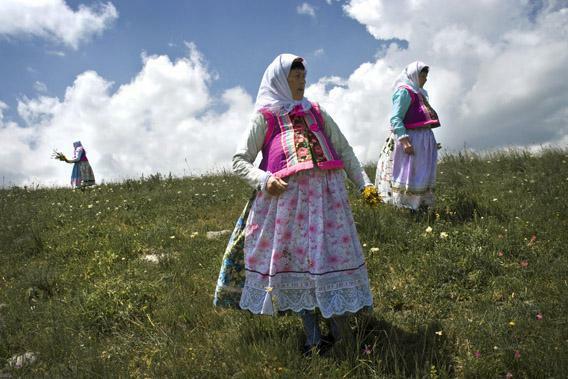 Doukhobor women in Gorelovka, Georgia. Each Friday Roads & Kingdoms and Slate publish a new dispatch from around the globe. For more foreign correspondence mixed with food, war, travel, and photography, visit their online magazine or follow @roadskingdoms on Twitter. GORELOVKA, Georgia—The July sun had yet to shake the night chill from the air, so the men stood hunched with their hands in their pockets, watching the appointed soup makers stir two large cast-iron caldrons full of borscht and lapsha. The two men worked over a brazier of tezek, bricks of dried manure that are the favored fuel in a land that has few trees but many cows. 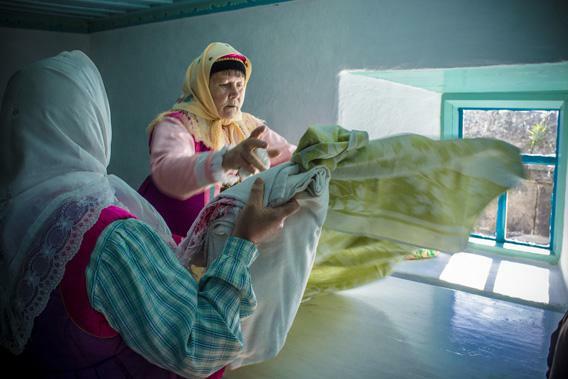 They were preparing the food for a Doukhobor wake that would mark 40 days since another member of their religious sect, a carpenter named Vladimir Smorodin, was taken by old age. More than 80 Doukhobors would gather that day in the sod-roofed home to pay their respects. The wake might as well have been for the Doukhobors themselves. After 300 years of tumultuous history, this remote strain of pacifists, who have called the mountain highlands of Georgia their home since Tsar Nicholas I exiled them in the 1840s, is about to disappear. A splinter from the Russian Orthodox Church, their way of life rests on the brink of extinction, as the few who remain either pass away or return to Russia, leaving their life in the mountains behind. Their numbers in Georgia today have dwindled to 500; here in Gorelovka, once their spiritual center, there are 145 left. Their ineluctable exodus north, to cities in modern Russia, could spell the end of an entire culture, something akin to what would happen if all the Amish slowly moved to Pittsburgh. Removed from their villages, they would be swallowed whole by the modern world. The irony is that the Doukhobors never wanted to leave Russia in the first place. They emerged in the 1700s in the Tambov region of Russia, a Christian sect that believed God resides within every person, rendering the need for the church and all its trappings—icons, buildings, rituals, even priests—unnecessary. These views did not endear themselves with the Russian Orthodox Church, and in 1785 an archbishop gave them the name Doukhobors, which means “spirit wrestlers.” It was meant as an insult, but they embraced it. The sect rejected the authority of the state, refusing to pay taxes or serve in the military, and by the 1840s became such an irritant that Tsar Nicholas I exiled nearly 5,000 of them to the edge of the Russian empire. Many of the Doukhobors died on the treacherous 70-day wagon journey. Doukhobor man in Gorelovka, Georgia. They founded eight villages—the largest of which was Gorelovka—in the distant peaks of what is now the Republic of Georgia’s Javakheti region, near the border with Turkey and Armenia. They flung themselves into creating a place for themselves in this new inhospitable climate—the winters are harsh and long in the mountains here—by tilling the rocky soil and taming the land to build a tidy town of sod-roofed homes with whitewashed walls and carved wooden shutters that are painted cheerful shades of blue. As the Doukhobors don’t have churches, Gorelovka’s spiritual and civic life is centered around the orphanage, a mint green building that was built in the 1800s. 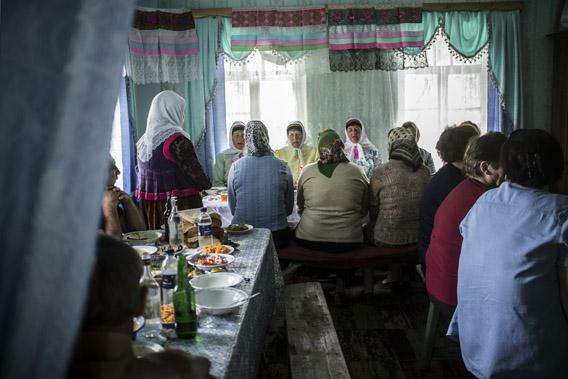 Every Sunday a dozen Doukhobors still meet there for prayers. In the summer, white storks with clattering beaks stand atop their huge nests, which are balanced precariously on the sod-roofed houses and utility poles. (Armenians call the town Aragilneri Gyugh, stork village). 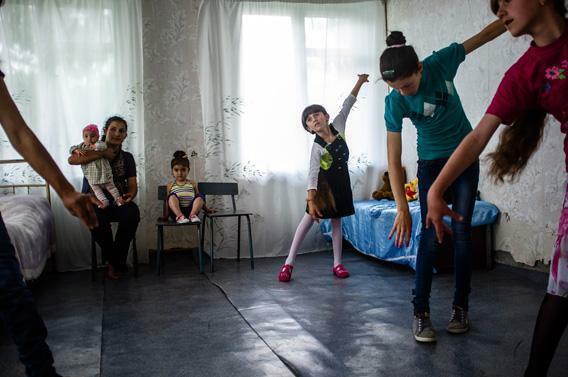 The village still feels a part of the 19th century, despite the satellite dishes, cellphones, and 18-wheelers that pass through the town’s one paved road on their way to Armenia or Turkey. The remaining roads are no more than rutted dirt paths, spackled with cow patties from the twice-daily cattle drives up the nearby hills and back again. 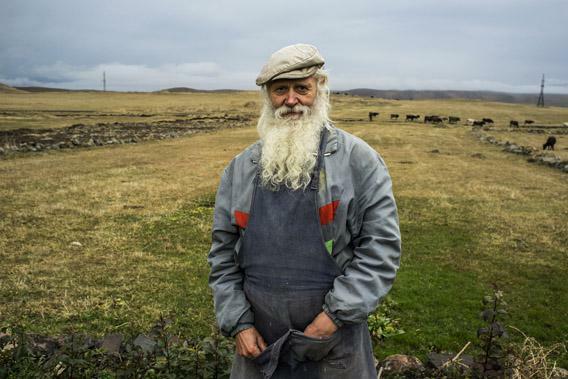 “The Doukhobors, we made all of this ourselves,” says Nikolai Sukhorukov, 59, a village elder of sorts with an inquisitive face and a long white beard. The Doukhobors eked out a relatively quiet existence here until 1895, when they rounded up all the weapons in the villages and burned them in protest of the Tsarist government’s military draft. They paid dearly for their principles: Some were deported to Siberia, others were imprisoned and tortured. But they gained an unlikely savior in Leo Tolstoy, the famed novelist who was undergoing a spiritual renewal in the later years of his life. Tolstoy admired the Doukhobors’ pacifism and met their leaders at his estate in Yasnaya Polyana, in what must have been one of history’s great beard-summits. He engaged in a furious letter-writing campaign on their behalf, including one missive sent to Sweden suggesting the first Nobel Peace Prize be awarded to these remote people. Eventually he donated the profits from his final novel, Resurrection, to resettle a group of more than 7,500 Doukhobors from the Caucasus to Saskatchewan in 1899. Some 25,000 of their descendants still live in Canada, but the majority of them have assimilated. For those left behind in Georgia, Tolstoy sent money to build a school in Gorelovka that still bears his name. The school is a well-maintained, whitewashed building with a black-and-white portrait of its famous benefactor hanging in the office. However, as with the rest of the town, the school’s future is uncertain. “We’re trying to save the school,” director Tatyana Kirova told me as she led me down the building’s single dimly lit hallway, showing me the classrooms each heated by their own stove. Hand-lettered posters in Russian and Georgian hung on the walls alongside educational posters from the Soviet era. When Kirova graduated from the school in 1992, it had 300 students. Today there are 32. Most of the town’s children attend the Armenian school down the road. In Gorelovka today, Doukhobors are outnumbered at least 15-to-1 by the majority Armenians; in the broader Javakheti region of Georgia, the ratio is 200-to-1. And various Armenian groups, both moderate and more hardline paramilitary groups, have been a part of de facto Armenian control of the region since the fall of the Soviet Union. That may make Doukhobors anxious, but the Georgian government likes it even less: On the heels of a series of bloody wars of secession by Ossetians and Abkhazians, Georgia is wary of any demographic imbalance within its borders. One solution has been to periodically resettle ethnic Georgian Muslims in empty Doukhobor houses. Rivalries run deep in this part of the world. Lukeria Medvedova, an octogenarian left in Gorelovka after her extended family moved back to Russia, takes a dim view of her Armenian neighbors. “They know I see poorly and so they take things off my clotheslines,” she said, as she stooped over a metal bowl of laundry in her kitchen, swirling the soapy water with her hands. “They steal and steal and steal.” She was widowed 53 years ago, and her only son died when he was a teenager in the 1970s. As is Doukhobor custom, photos of them as corpses in their caskets hang alongside other less grim family pictures. Yet she has no desire to leave her one-room home, which is tidy and well-kept despite her waning eyesight. “I didn’t exist when this house was built,” she said. The Doukhobors’ return to Russia began as a trickle in the glasnost era and has gained momentum since then. In 2007, Russia launched a “voluntary migration” program under President Vladimir Putin, as a means of stemming Russia’s demographic collapse. The results are mixed: More than 98,000 ethnic Russians have been lured back to the motherland under the program, but a far larger exodus out of the country, particularly of the wealthy and highly skilled, continues. In Javakheti, the reasons for Doukhobors moving out seem to be largely economic: Russia’s per capita GDP is $14,000 compared to Georgia’s $3,500. This is why Tamilina, the schoolteacher, and her husband bought a house in Bryansk, Russia, five hours southwest of Moscow, a year ago. They’ll be leaving as soon as they sell their house in Gorelovka. Her 23-year-old son Alexander has already moved, bringing home $1,000 a month remodeling apartments, 10 times what he could make in Georgia. The move, she says, will still pain her. “Georgia is my homeland. Russia is not.” And besides, like many of the Doukhobors, they’ll be moving to the big city. There are Doukhobors in Russia, but no Doukhobor villages. Doukhobor men and women gather to eat and pray, Gorelovka, Georgia. Twice a day, a dozen Doukhobor women board a white van and make a jolting trip a few miles up into the hills where a herd of brown, handsome cattle have spent the day grazing. The women head into a room in the barn to don headscarves, aprons, and sensible, waterproof shoes or clogs (the better to dodge fresh cow patties and errant squirts of milk) and head outside to the waiting herd. For the next two hours, they milk, filling up 14 large stainless steel cans. Not that it’s easy work—one wandering animal vexed her owner enough to elicit a rather irreligious “Cursed cow! Damn cow!” from her. The milk they gather is made into cheese at the Doukhobors’ small workshop, either for their own consumption or to be sold locally. Cheese and other dairy products are just about the only items the Doukhobors in the village still produce. There are some who recognize what’s at stake. After living in the Ukraine for more than a decade, Vasily Slastukin moved back to Gorelovka in 2002, in part to take care of his aging parents, in part to raise a family in the traditional Doukhobor style. Now 57, he prays at the orphanage with the elderly women and passes down oral histories to his two young daughters. As in Soviet times, Slastukin explained, oral traditions and village life are what keep Doukhobor culture alive. “Preserving these traditions is much harder than just going to church,” he says. Inside the house on the day of the wake, around 12 women, mostly in headscarves, prepared typical Doukhobor sides: cucumber and tomato salad, eggplant with walnuts, fish jelly, homemade cheese, mashed potatoes with eggs, and ground liver. Sitting on mint green benches at the head table, the women—in a hodgepodge of plaid and pastel, outfits completed by colorful vests featuring hand-embroidered roses—started praying, then singing mournful songs in unison with long, drawn-out vowels. Anya Smorodina, 66, the widow of the deceased, bowed and touched her head to the floor several times. The singing continued as everyone ate, washing down the food with shots of vodka and fennel soda. As one woman explained to me as we took our seats at the table: “We need to preserve this.” The question of where it might be preserved remains unanswered. For more of Natela Grigalashvili’s photography from Javakheti and around Georgia, visit natelagrigalashvili.ge.